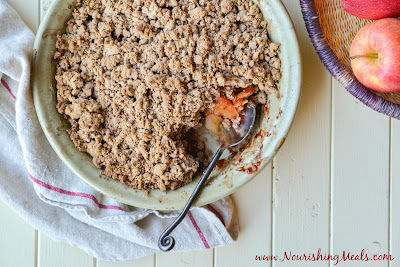 I'm excited to be sharing this amazing apple crisp recipe with you today. It's made with prebiotic-rich tigernut flour, which is a grain-free, nut-free, healthy gluten-free flour. Going on an elimination diet can be challenging sometimes, especially during the holidays and family gatherings where food plays such an integral role in the celebration. Having alternatives that are just as tasty as your old favorites can make it much easier to stick to your new diet. Have you tried an Elimination Diet yet? Usually within 2 to 4 weeks of removing foods like gluten, dairy, and sugar from your diet, skin conditions clear up, back and joint pain goes away, chronic fatigue disappears, and intestinal issues calm down. On top of that, most people lose around 7 to 10 pounds of unwanted weight. Why? Because food can be the most common source of irritation to your immune system. How will you know if foods are causing your brain fog, fatigue, pain, or skin issues? Do an Elimination Diet and find out. It's really an enlightening process. I wrote about the process last year in my Green Kale Detox Soup post. This Elimination Diet apple crisp recipe can be enjoyed by your whole family. My children really love it! In fact, one of my 10-year old twin boys made a double batch of this recipe the other night, using part blueberries and part apples in the filling. It was so good! I posted some photos on my Instagram account of the process, as well as of the finished product that you can view here. Tigernut flour can sometimes be tricky to find in your local health food store. I suggest ordering it online here. You can also learn more about Tiger Nuts here if you are interested! If you have children and are in need of some inspiration on getting them to love their veggies, then this kid-friendly recipe is for you. I'm visiting my family in Wisconsin now. My children love to play with my brother's four children who are all about the same ages as mine. Now, my children love their vegetables, but my brother's children are not the same. They are a little more hesitant to have a gigantic pile of raw vegetables fill their plates. My oldest niece is the most adventuresome when it comes to new vegetables. She always asks what I'm eating and wants to try it. The other day she tasted purple daikon radish for the first time and loved it, as well as sliced raw kohlrabi. So when I introduced her to this salad, she literally could not stop eating it. Even before dinner was served she was stealing the lettuce and vegetables off the platter! Beautiful, bright colors excite children. Why do you think candy is dyed with the most brilliant colors? A platter of fruits and vegetables arranged in a beautiful way is pleasing to the eyes, and even before we eat, our eyes send messages to our brain to begin producing digestive juices in preparation for what is before us. 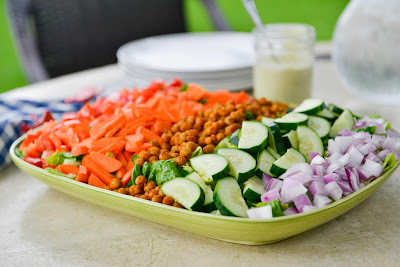 If you make the vegetable presentation appetizing to your children, you might be more likely to naturally gain their acceptance in eating a plate of fresh vegetables. The key to children trying something new, and enjoying it, is patience and persistence (keep offering it)! It's summer! Time to break out the ice cream maker and whip up some dairy-free ice cream. Plus it's cherry season right now. This coconut milk-based ice cream is a perfect way to indulge in both antioxidant-rich cherries and dark chocolate. Serve it as a sweet treat after dinner, or a healthy mid-afternoon snack for your kids. 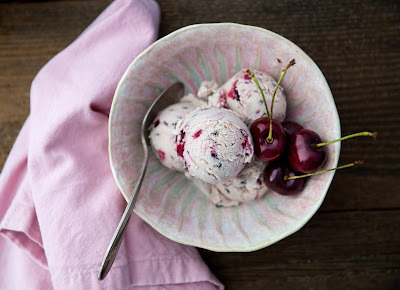 This cherry chocolate chunk ice cream comes from my Whole Life Nutrition Cookbook. Be sure to use full fat coconut milk in this recipe. The hemp seeds give it some extra creaminess, healthy fats, and amino acids. You can easily omit the chocolate if you are on Phase 2 of the�Elimination Diet. You can also replace the cherries with blueberries, strawberries, or diced mango. All variations are delicious! This recipe is great for those of you who are on an Elimination Diet as it is very easy to make, and when paired with plenty of vegetables, it becomes a very nourishing, anti-inflammatory meal. We like to use lettuce leaves or napa cabbage leaves as our "buns" for burgers, though sometimes my children like the extra carbohydrates of a gluten-free bun (they are so active and hungry all the time)! Look for organic ground turkey at your local food co-op or health food store. Sometimes it is in the freezer section. I make turkey burgers about once a week (especially now with the warmer weather). Sometimes I omit the chopped fresh herbs and add a tablespoon or two of a good quality Thai curry paste. I also replace the parsley with cilantro. My children really love this Thai-flavored version too! 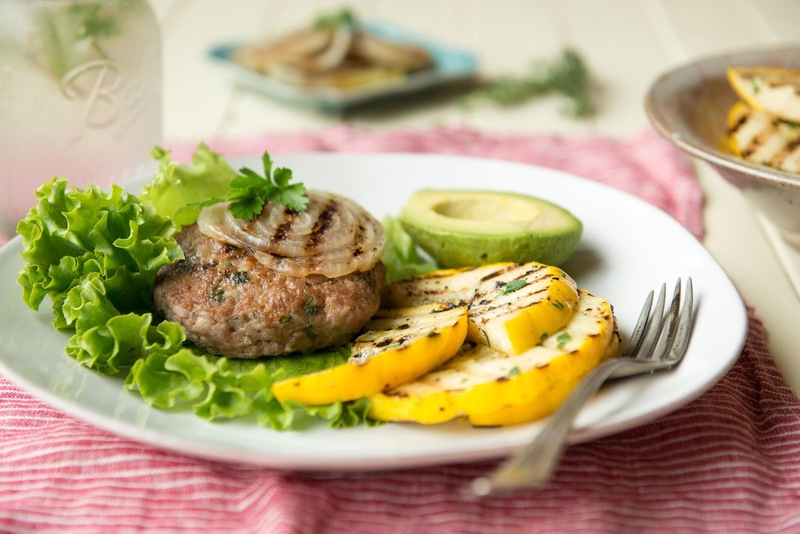 Serve burgers with baked sweet potato fries if you are on the Elimination Diet. If not, try some potato fries. My kids love homemade baked oven fries using russet potatoes that are seasoned with smoked paprika, garlic powder, black pepper, sea salt, and avocado oil. In the summertime I also like to grill summer squash from my garden using my cast iron grill pan on the stove to serve with these burgers. Serve burgers with a garden salad and a homemade dressing for a balanced, nourishing meal! 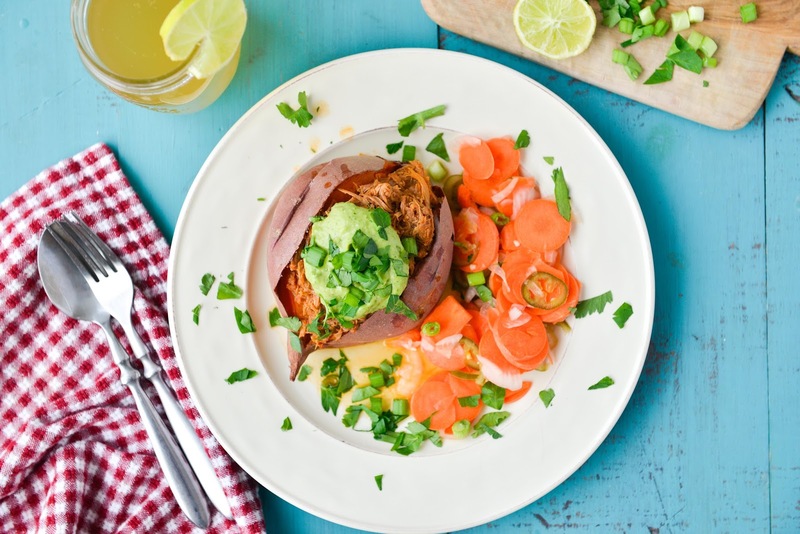 Frittatas are just about one of the easiest, nutrient-dense meals you can make....and they can be whipped up in minutes! Serve a frittata for breakfast, lunch, or dinner. I frequently make frittatas to use up the odd bits of leftovers or random veggies in the fridge. I love using leftover salmon and roasted potatoes in a frittata. Green onions, chives, sausages, red bell peppers, yellow or red onions, olives, zucchini, basil, and broccoli are also wonderful ingredients to add to your frittata! A frittata is made by first saut�ing some vegetables in a little butter or olive oil in a 10-inch cast iron skillet, then you add 8 to 10 whisked eggs (sometimes grated cheese too) and pop the whole pan in a preheated 375 degree oven for 20 to 25 minutes. It will puff up as it bakes, then fall as it cools. Cut your frittata into wedges and serve with a salad. So easy! 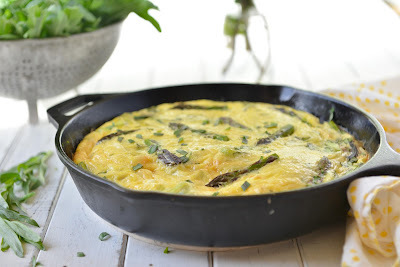 This frittata recipe uses some in-season spring vegetables, plus fresh tarragon to create a complex-flavored meal that will remind you of French cuisine! Asparagus and tarragon pair so well together! Yum! Serve it for Mother's day brunch with a salad and some sparkling mineral water. If you or a family member cannot tolerate eggs then I would suggest baking a salmon fillet and serving it with a salad for Mother's day brunch. Salmon for brunch is a great egg-free option! 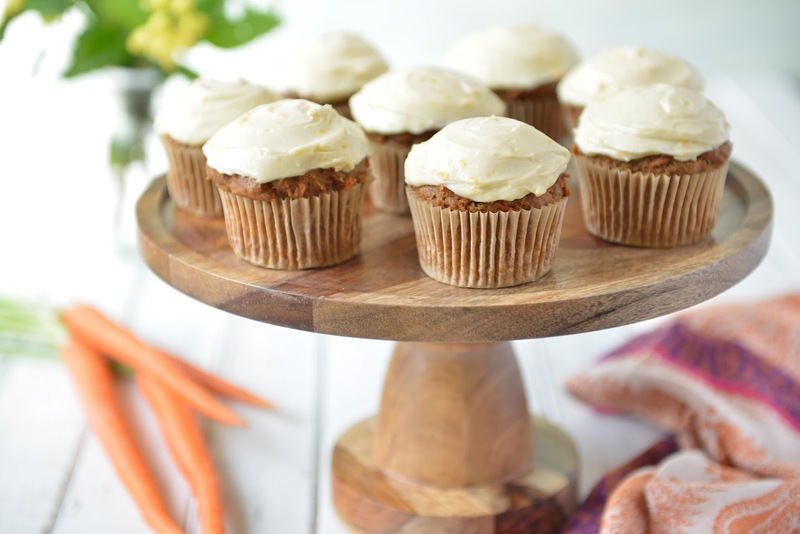 Yay for gluten-free carrot cake muffins! I call these healthy little treats muffins, but once frosted they sure seem like cupcakes to me. They are packed full of carrot-goodness, as well as being very moist and light, even without the eggs. What a perfect treat for Mother's day or a Springtime gathering! I've frosted them here using a Honey-Cream Cheese Frosting (recipe below) but if you are dairy-free or vegan then use my Sweet Potato Buttercream Frosting recipe. Just be sure to use white-fleshed sweet potatoes (they have a light-tan skin), and stir in some finely grated orange zest at the end. This recipe is a perfect dairy-free, whole foods replacement for cream cheese frosting (and it looks like it too as long as you use the white sweet potatoes). The trick to making these egg-free muffins light and fluffy is to add the carrots on top of the whisked dry ingredients, immediately then pour in the blended wet ingredients, and then mix them all together at once. If you stir in the carrots at the end, after your batter has been mixed up, then you will lose some of the trapped air that is formed from the reactions of the baking powder, baking soda, and acid ingredients (applesauce and orange juice). Then you must bake them right away in your preheated oven. Starting the baking process immediately after mixing the batter together helps to trap air and create lift! Both of these steps will help give the muffins the rise and lightness you normally get with eggs. If you want to add other ingredients such as chopped walnuts and raisins, go ahead. A half cup of each should work well. Also....did I mention that these muffins are Elimination Diet friendly for Phase 2 and beyond (without the cream cheese frosting and citrus of course)! Enjoy! Are you working to eliminate dairy from your diet and in need of a creamy "milk" to add to your morning coffee or tea? 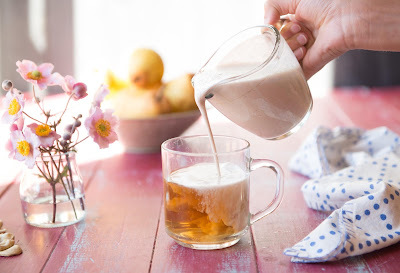 I've been making this dairy-free cashew creamer for over a decade and never get tired of it! I don't drink coffee but like to add it to turmeric-ginger spice tea, Dandelion Root Chai, roasted dandelion root tea, and sometimes a maca hot chocolate drink I make. I know many people who follow a paleo diet and like to add coconut milk or coconut cream to their tea or coffee, but every time I try this I'm quite repulsed by the overwhelming coconut flavor! This cashew creamer does not overpower the beverage that it is added to, yet still offers a warm, rich flavor. If you own a high-powered blender then you can whip up this recipe in minutes, if not you will need to soak your cashews for a few hours in a bowl of water (and then drain) before blending. Another option, if you don't own a high-powered blender or are out of raw cashews, is to add a large spoonful of raw cashew butter to your blender along with 1 to 2 cups of water (plus the other ingredients below) and blend into a creamy milk! I do this on occasion if I'm out of cashews and the milk is so smooth creamy. Even though this dairy-free cashew creamer is so rich and creamy, it is actually full of heart-healthy monounsaturated fats! In fact, 82% of the fat in cashews is unsaturated, and about 66% of that is monounsaturated. Cashews are also a great source of some very important minerals, including magnesium, manganese, copper, phosphorus, and zinc! If you are following the Elimination Diet, then this recipe can be used in Phase 3 during the reintroduction of nuts. Spring is finally here! I just want to soak up each and every moment of sunshine we have, as it's been a particularly dark and rainy last couple of months. This healthy gluten-free lemon poppy seed cake will surely brighten any day! Serve it for Easter brunch or as part of a Mother's day breakfast. It's not particularly sweet, but definitely bursting with lemon flavor. It's quite easy to make and free of many of the common allergens, except eggs. The lemon-honey glaze on top seals in moisture and adds even more lemony flavor. I think you and your family will enjoy it. My children just love this cake! This grain-free, paleo cake recipe is actually an adaption of the Lemon Poppy Seed Muffin recipe from my new Whole Life Nutrition Cookbook. 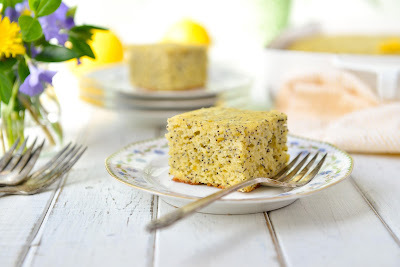 A few years ago (in 2014) I was asked by the Institute for Functional Medicine to create a Lemon Poppy Seed Cake recipe for a special banquet dinner event held during the their annual conference that year. This is the recipe that I created and that was served to hundreds of IFM members that evening (in individual miniature bundt cake form with fresh berries on top)! My friends and family have been making this recipe since....and now I'm finally sharing it with you. Enjoy! I really love being able to toss ingredients into my slow cooker in the morning in order to have a meal ready to go later in the day, don't you? There's just so much less stress, and I feel so organized, with a clean kitchen going into dinnertime! This recipe for tomato-free, paleo slow cooked beef can be used in a multitude of ways. If you don't want to stuff it into baked sweet potatoes then you could use it as a taco filling for corn tortillas, Brown Rice Flour Tortillas, or simply served with saut�ed kale and cabbage! If you or some of your family members eat dairy you could put the beef into the sweet potatoes and then top with shredded raw cheese and place in your oven under the broiler for a few minutes to melt the cheese (some of my children like this)! I first made this with some of my lacto-fermented hot sauce (yes, I cooked my precious sauce)! After that I wanted to recreate it using some of the same ingredients from my sauce that everyone could find and use. This recipe contains bell peppers and hot peppers, but no tomatoes, and it's not too spicy (my children eat this). If you are following our Elimination Diet and have tested out ok for peppers and beef then you can enjoy this during the rest of Phase 3. In fact, you could even use this recipe for testing beef in Phase 3! I hope you enjoy it! I have a very fun recipe for you today. One that your children will love to participate in making......gluten-free bagels! 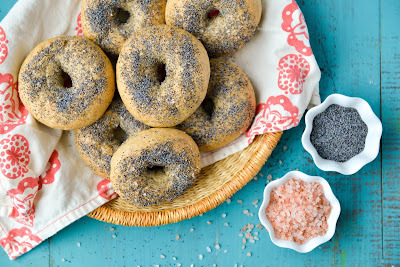 I've been making these ever since my oldest daughter asked me to create a gluten-free bagel recipe about four years ago. I had just published the first edition of Nourishing Meals, which contained�plenty of amazing gluten-free, vegan bread recipes, but no bagel recipe! She encouraged me to test out my breadstick and bread recipes in bagel form and they worked great. We've had fun making these together to send on her school camping trips throughout the years. The big difference between bagels and a roll or a breadstick is that the dough is boiled after rising. This creates the chewy bagel texture that we all know and love. I've created a photo tutorial for you below to help make the bagel-making process very easy to understand. There are so many variations to this recipe! Cinnamon-Raisin (my Buckwheat Cinnamon-Raisin variation will be posted soon), Garlic-Herb, Sesame, Poppy Seed-Sea Salt (pictured here), and more! Please let me know in the comments what types of flavor variations you created using my recipe. This gluten-free bagel recipe is nearly identical to the Rosemary-Sea Salt Breadstick recipe on page 121 in my Nourishing Meals book. I've just changed the way in which they are made, and switched out one of the flours for another. I hope you enjoy!